The total price for the ebooks and the TV series links sold seperately is $60... You save - $50.00 when you buy the entire BUNDLE PACKAGE. Use the secure “Buy Now” button at the bottom of this page. A metal detector can pay for itself and put extra money in your pocket. Many people, including myself, have found thousands of coins, and jewelry pieces in parks, and other areas. Of course I’ve been detecting, and treasure hunting for almost 40 years, so I’ve spent a lot of time at this. Your not going to find hundreds, or thousands of coins ASAP, unless you get lucky and find that pot of gold at the end of the rainbow…and yes, those do exist. 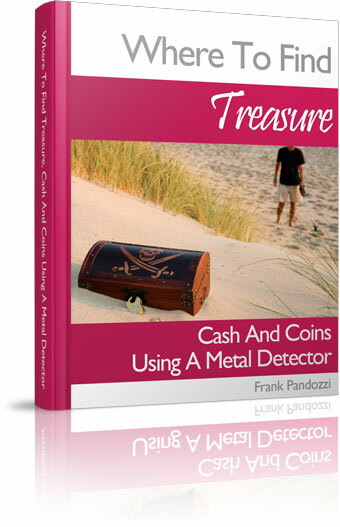 In my ebook, “Where To Find Treasure, Cash And Coins Using A Metal Detector”, I will tell you about places to search that have always proved to be great sources for coins and jewelry. All of my eBooks are in digital format - ready to download. There are no hard copies. Learn where to search with a metal detector in areas others may have missed. How to buy the right detector. How to turn your hobby into an exciting business. How to have good old Uncle Sam pay for your metal detectors, your trips, your food, and more. How to use auctions and flea markets to find hidden cash. Where to search those unusual hiding places for cash and coins. Make money with a detector by selling your finds on Ebay, at garage sales, and flea markets. 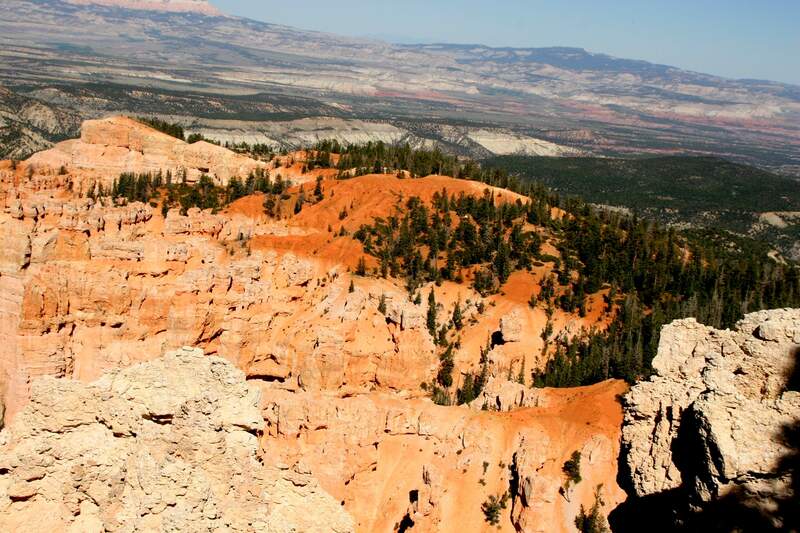 Tell you about a few of my treasure hunting adventures. Show you how to turn your hobby into a metal detecting job by working with Insurance Companies to make extra money. “Frank Your ebook, Where To Find Treasure was great! I’ve been metal detecting for about 10 years and never thought of going to some of the places you mentioned. Your ebook has ignited my enthusiasm once again for the hobby. When is your next book coming? “Hi Frank, Loved your book. I downloaded Where To Find Treasure, Cash And Coins Using A Metal Detector. The book will pay for itself. I am eagerly awaiting others that may be coming. Any idea when they will be available? "Frank, I learned a lot from your're book. Well worth the price. Just click on the information below for a secure purchase and your ebook will be instantly ready for download. And remember, you can contact me at anytime through this website. "Hi Frank! Its LoriAnne, The book was fantastic ?? Thank you very much! there were a number of things I had not thought nor heard of, Of course being such a newbie. I'm so dying to get out there and dig but being in central Ontario my ground is frozen solid with various depths of snow everywhere! .... can't wait to dig my first target ?? and my first coin or piece of treasure?? when I do I'll shoot you a msg to follow through and let you know how I did! 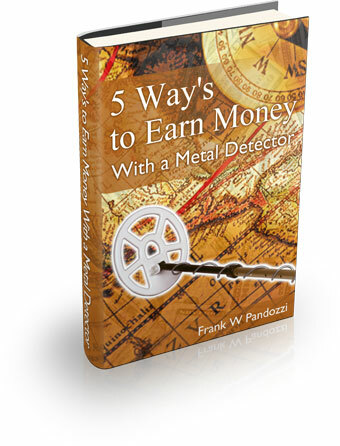 I'll show you how to make money with a metal detector and have fun at the same time. All of the money making ideas in this ebook are proven methods that I have used over the past 40 years. In my ebook you will read about how one ad of mine produced more than $5000 in income. You can look at this hobby as a new found metal detecting job, or a business to earn profits, either way, the information in my ebook work. I have been earning money with my metal detector for many, many years. So can you! Click on the image to purchase this ebook separately. 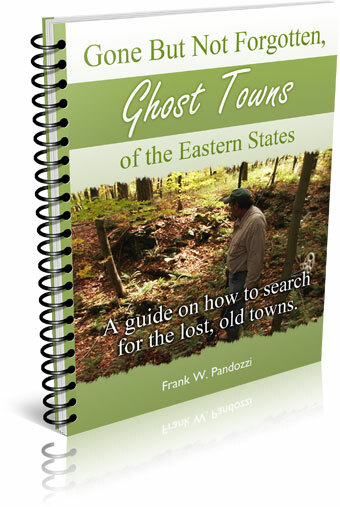 If you're interested in how to locate the ghost towns of the eastern states. Gone But Not Forgotten, Ghost Towns of the Eastern States. Are you running out of places to metal detect? Do you need a “kick in the pants” to refresh your ability to find new areas? Do you know what the law says about digging relics? Do you frequent garage sales, estate sales, and flea markets? If so, you’ll find some interesting information about items that were used as hiding places for cash. 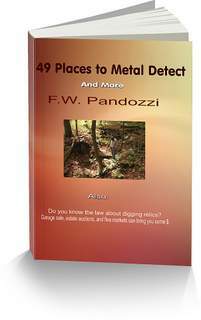 Here is my ebook "49 Places to Metal Detect, And More"
Click on the image to purchase separately. And remember, you will also receive the links to my TV series. 13 links, each is a half hour show.